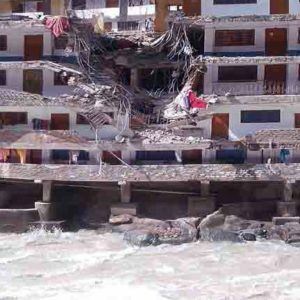 In an unfortunate tragedy, 10 people were killed and many were feared trapped under debris after landslide triggered boulders fell on Gurdwara Manikaran Sahib in Kullu (HP). “The incident took place around 2 PM when boulders fell on the shrine building. Ten bodies have been retrieved from the rubble. Fifteen injured have been admitted to the regional hospital. The rescue operation is still on to locate others,” Kullu Deputy Commissioner, Rakesh Kanwar told Mail Today. According to locals, six people are still trapped inside the parking building. The deputy commissioner said that nearly 200 rescuers including 40 NDRF personnel, 84 SSB, 28 ITBP besides the police jawans are doing the rescue operation. He said that the exact number of pilgrims is not known as the Gurudwara administration is not able to confirm the exact number of pilgrims. Manikaran (Punjabi: ਮਨੀਕਰਨ) is located in the Parvati Valley between the rivers Beas and Parvati, northeast of Bhuntar in the Kullu District of Himachal Pradesh. It is at an altitude of 1760 m and is located about 45 km from Kullu. ,Gurdwara Shri Guru Nanak Dev Ji, also called as ‘Gurdwara Manikaran Sahib’ is an historical sikh shrine present there which was discovered by Baba Narayan Hari, the history of the gurdwara sahib is mentioned in Bhai Bala Janamsakhi and Twarikh Guru Khalsa. The place is famous for its hot boiling sulphur springs, which are revered by lakhs who come here for a dip in the curing waters. It is believed that the hot springs can cure skin diseases or even ease the swelling caused by gout. A huge Gurdwara has been erected in the memory of Guru Nanak who is believed to have visited this place. A number of Sikh and Hindu pilgrims visit the Gurdwara every year.